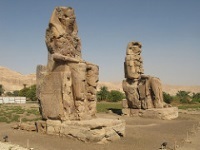 The West Bank is an area of limestone hills and valleys riddled with tombs and temples across the river from Luxor. Goats roam freely among the ruins, and the tiny settlements on the slopes provide a splash of colour in an otherwise desert-like barrenness. The 59 foot (18m) high pair of enthroned statues of the Colossi of Memnon are the first things most visitors will see on the West Bank. These are the only remaining structures of the mortuary temple of Amenophis III. Most travellers come to visit the Valley of the Kings, where the secretive tombs of the Pharaohs were built to immortalise their mummies and treasures for eternity. In an attempt to thwart tomb robbers, traps and deceptions were part of the architectural planning. Dramatic descents, spectacular murals on the passage and chamber walls and a replica of the original sarcophagus at the end of the tunnel create an awe-inspiring atmosphere. There are a number of areas and tombs to explore and highlights include the tombs of Tutankhamun and Ramses II. However, the country's finest tomb, the Tomb of Nefertari, lies in the Valley of the Queens, which has exceptional painted murals. Nefertari's tomb is open to the public after a restoration project. However, only small groups are admitted at a time, and each visitor must pay 1000 Egyptian Pounds (about $56). Also worth a visit is Hatshepsut's Temple, the mortuary temple of Egypt's only female Pharaoh.